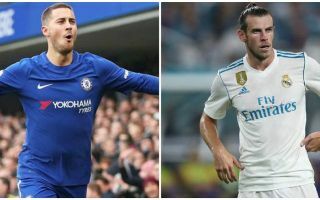 Spanish football expert Guillem Balague says he expects Gareth Bale to be part of the equation involving Chelsea star Eden Hazard’s transfer to Real Madrid. There has been plenty of speculation regarding the Belgium international leaving Stamford Bridge in the near future, with things not helped by the fact that he’s yet to sign a new contract. Hazard’s current Blues deal is set to expire at the end of next season, putting Chelsea in a weak negotiating position regarding his future. Meanwhile, a recent report from the Sun states some talks have already taken place over Hazard moving to Madrid, with the Spanish giants sending chiefs to London and preparing an opening offer for the player. Still, Balague has some slightly more encouraging news for Chelsea in that he believes Bale could be offered as part of a swap deal involving Hazard. ‘If Chelsea had the possibility of signing Bale it would be a swap with [Eden] Hazard and I expect all that to appear in the equation,’ Balague is quoted by the Daily Express. Gareth Bale to be offered to Chelsea in Eden Hazard transfer deal? ‘But I feel Bale doesn’t want to leave. Bale would like to stay at Real Madrid. The Welsh winger seems an ideal replacement in attack, even if his recent form has left a little to be desired. Bale has proven himself a world class performer throughout his career, and was particularly successful in his last spell in the Premier League with Tottenham.